A Philadelphia woman claims she found feces in her order of Domino's Pizza cheesy bread on Sunday, July 22, 2018. On Sunday night, Marta Rusek called her local Domino’s Pizza to get two orders of Stuffed Cheesy Bread and Chocolate Lava Crunch Cake delivered to her place not far from Rittenhouse Square. Things did not go as she’d hoped. “I had settled in to watch the latest episode of ‘Sharp Objects’ when I took a bite and my food tasted funny,” she said, explaining that she orders in bulk so there’s enough left over for lunch the upcoming week. “I looked down and saw the mystery ingredient and then immediately called the store. Her decision to go hungry makes sense when Rusek explains that she thinks the mystery ingredient was feces from an unknown source. The photos she shared of this discovery seemingly validate her suspicions. It was so troublesome, in fact, that the city’s Health Department and Domino’s corporate office have already been contacted to investigate. Rusek said her concerns were not initially met with urgency by those who answered the phone at the Domino’s store at North 21st and Hamilton streets near the Barnes Museum. “When I called the store, the staff said, ‘This better not be a prank,’” she said. “The first person I talked to definitely tried not to laugh and I could hear someone say ‘That’s funny’ in the background,” she said. Philly, do NOT order from the @dominos on North 21st St. 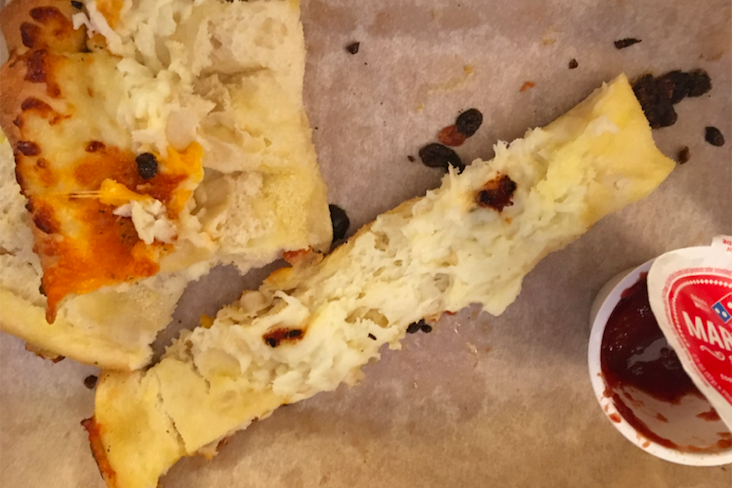 I was halfway through an order of cheesy bread when I noticed a weird brown spot in it. It was poop. The health department's Office of Food Protection tried to inspect the pizza shop on Monday, but found the store closed and the windows covered up, a spokesman said. The city will continue its efforts to conduct an inspection, he said. Domino's corporate office did not immediately respond to a request for comment about Rusek's claims on Monday morning. For her part, Rusek went to get checked out at an urgent-care center on Monday morning since a woman she served with in the Peace Corps contracted Hepatitis A from eating feces-contaminated food. She said they couldn't perform a blood panel, told her it could take months for symptoms to manifest and were more concerned about E. coli. "I'm going to have to go to my doctor for several months so they can monitor me for any problems," Rusek shared. "So, I'm about to have more medical bills, and miss time from work, because one person decided to put food with poop in it out into the world." Of lesser concern, her penchant for ordering out has been impacted, as well.